Because my parents were free earlier this afternoon, I invited them to join me for a drive to get our sons (their grandkids) from school. Last week, when Pa was away taking care of business in Manila, Ma went with me. We made it a treat to buy our afternoon snacks from the school cafeteria while waiting for Kyle and Jake to get off from their classes. We simply love the allowance-friendly native "kakanin", banana-cue and fresh buko juice. Beats having costly snacks at the mall, hands down. This afternoon was Pa's first time to join and Jake was happy to see all of us. I guess he's proud to have his grannies there. 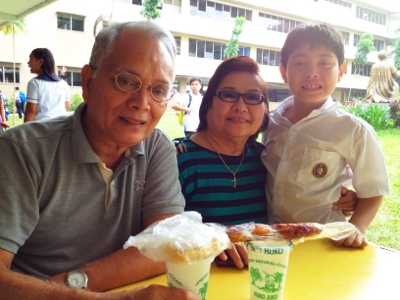 It was special having Pa and Ma in the school canteen sharing native snacks with me and my boys... It's something my boys and I will remember dearly.